Before start sowing, you need to know that all the species belonging to the Tephrocactus genus are not easy to germinate, and it may take up to four years to see the seedlings. The Tephrocactus seeds have a very low probability of growth due to an inhibitor that covers them. 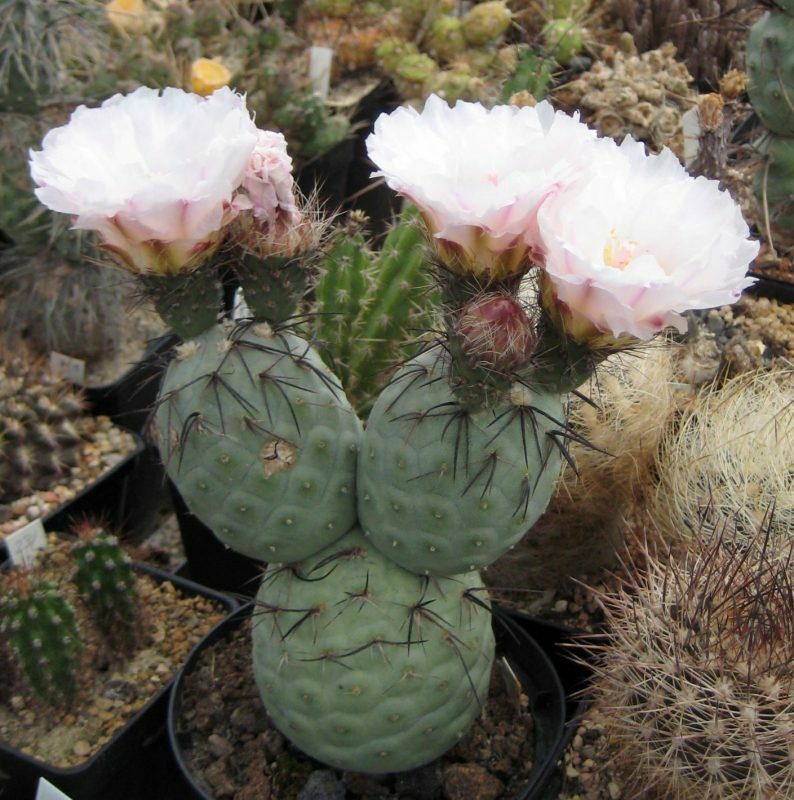 The right container to sow the Tephrocactus is a pot, forget the seed trays because if you are lucky enough and seedlings appear in less than a year, these plants do not like to be moved, though, there are some successful cases of people sowing in seed trays. The soil must have good drainage, and it must be porous. Combine cactus mix with sand, pearlite, or another mineral that helps with the porosity. In case you could not find the cactus mix, you may opt for using potting mix. Keep in mind that the mineral must be present in a greater quantity than the cactus mix, for example, 25% cactus mix, and 75% mineral. There are three ways to sow Tephrocactus seeds. The first is filling the pot with soil, sterilize it, moist it and spread the seeds over the substrate, do not bury them. Do not apply an extra layer of mineral. Spray the seeds with water and proceed to cover the pot with a glass sheet, a white paper or a plastic bag (the bag is preferable). Put the container in a window or any other place where there are sun and shadow, in this way the sun can touch the seeds without burning them. Tephrocactus love cool temperatures but, the seeds need a warm environment to grow. In a case where you live in not hot, the best thing you can do is to use a heat mat or lamps. The second method is to use the microwave to break the inhibitor of the seeds. Moist the seeds, and put them in the microwave for two minutes. Make sure you don’t burn the seeds. Once you broke the inhibitor, you must do the fourth step. The third method is through the water. In a pot with water, submerge the seeds, and try to wash it off the funicular girdle (the inhibitor). While doing this do not forget to be very careful not to break the kernel. People say that if the seeds are in the bottom of the pot with water, that means they are likely to grow. If you didn’t see any results in two months doing the three methods, do not give up. It may take years up to four years to see a seedling so, keep the pot warm and let it be. Watering: water them only when needed. In the spring, summer, and fall times do the watering only when the soil is dry (it is essential that you allow the substrate to dry before watering again). In winter let the plant alone. The water schedule of this plant should be very poorly. In this case, the saying the less, the more apply correctly. Temperature: this plant can go in hot temperatures as well as frosting times. Just be sure it is not receiving water, and everything will be right. Fertilizer: apply it sporadically, in fact, this is an optional step because this plant is very rustic. The fertilizer must be light, and the adequate quantity for the adult plant should be ¼ diluted in a liter of water. Pests and Diseases: apart from rotten roots and stems due to the excess of water the snails, are a serious problem who can destruct the plant that cost you years to grow. Use an insecticide that target snails and at the same time are cactus-friendly.